I am leaving you with a snapshot of another project I am working on, this one involving lots of folds and fantastic vintage Irish linen. 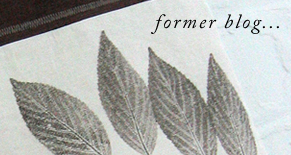 Prints of leaves will be incorporated at some point as well. Also, I can't resist these freshly sprung japanese maple leaves in my front yard. The color combination is perfect in that strange way that only nature can provide. Anywhere else it would look garish. Chicago is waiting. I'll be back next week with photos, marvels, and impressions. In "chicago", "gardening", "green", "linen", "process", "spring", "vintage", "white"
It is unseasonably chilly here in central Virginia, but somehow spring still makes its way. A buckeye sapling is unfurling its leaves and the crab apple in the far corner of our yard is in full bloom. The geraniums are leafing out (ready for printing yet again) and Trevor, the frog fountain, is waiting for action in his soapstone basin. The fruit trees are blooming as well, both plums and asian pears try hard to attract the honey bees... Thanks to all of you who visited the bloom show, in person or in spirit. The opening went well and the middle room in the gallery was bursting with lushness, flora, and fresh imagery. In "bloom", "gardening", "geranium leaves", "green", "spring", "white"
In "gardening", "magnolia", "spring", "white"